We place our Advisors’ Needs First - working together to improve capacity, expertise, and value in your business. We are committed to earning your business, and going above and beyond to keep it. Together DMI and The Patriot Financial Group have the experience and ability to grow your business. Working with a true Independent Hybrid RIA can provide you and your clients the freedom they want, allowing you to prioritize their interests. Our innovative, cloud-based wealth management technology can drastically reduce your overhead costs, streamlining your business processes for you, your staff, and your clients. Our Partner Program helps you find and build Centers of Influence relationships with CPAs, attorneys, P&C, and Life and Annuity agents to help drive more clients and revenue. Through our solicitors’ program, you can acquire a waiver for the series 65 exam, so you can work with and compensate CPAs, attorneys, P&C, and Life and Annuity agents. Working with the right IMO grants you access to award-winning, cutting-edge marketing for brand and web development, digital marketing, seminar programming, multimedia marketing, including video and radio. You will have a dedicated marketing consultant to help increase appointments, convert clients, and boost revenue for your practice. 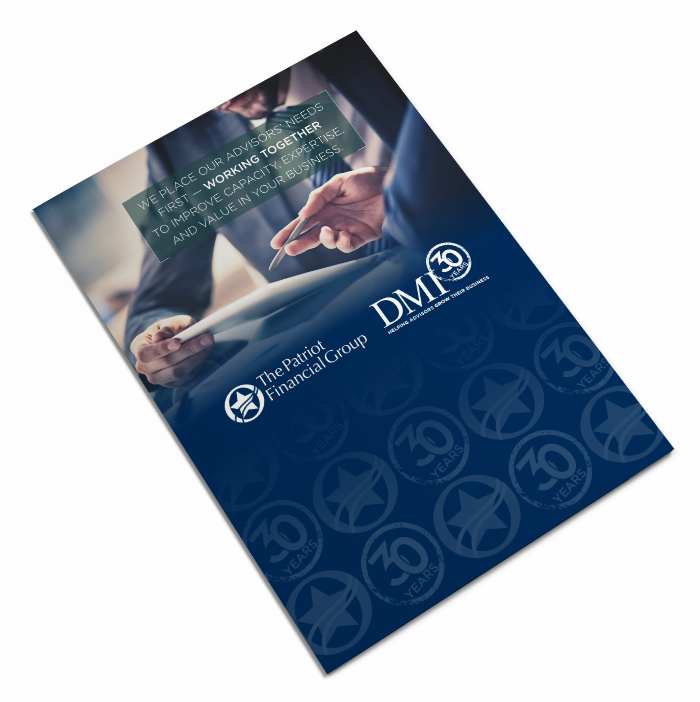 Together, DMI and The Patriot Financial Group have the experience and ability to grow your business. © 2018 DMI Marketing, Inc. All Rights Reserved. For financial professional use only. Not intended for use by the general public. DMI does not offer tax or legal advice. Always consult with qualified tax and legal advisors concerning your own situation. Insurance and annuity guarantees are backed by the financial strength and claims-paying ability of the issuing company. For Institutional Use Only. Securities offered through Securities America, Inc. Member FINRA/SIPC. Advisory services offered through The Patriot Financial Group. DMI Marketing, The Patriot Financial Group, and Securities America are separate entities.